I am currently working on the EU-funded LACE project. The LACE (Learning Analytics Community Exchange) project team members have a similar commitment to open practices to support of the project. 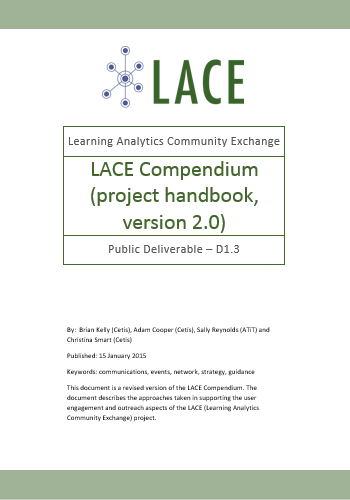 As an example we agreed that the LACE Compendium, the project handbook which documents the policies are practices the team are taking in supporting the user engagement and dissemination aspects of the project, would be published under a Creative Commons licence. 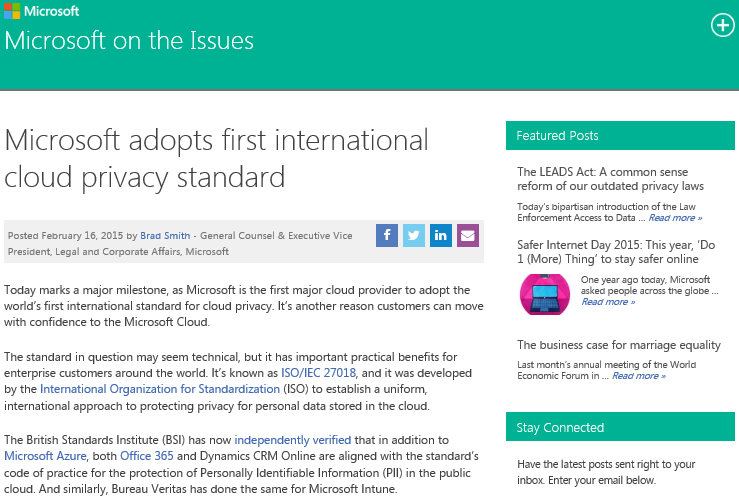 On Monday 16 January 2015 Microsoft announced that they had adopted the first international Cloud privacy standard. The standard in question is ISO/IEC 27018, the code of practice for protection of personally identifiable information (PII) in public clouds acting as PII processors. Yesterday was the first anniversary since I started work at Cetis. During that period I have been involved in two main areas of work: supporting the outreach and engagement aspects of the LACE (Learning Analytics Community Exchange) project and promoting use of open educational practices and in particular, use of Wikipedia. Later today I will be travelling to Edinburgh to give talks about Wikipedia at two conferences. Back in July 2014 W3C published an overview report on Standards for Web Applications on Mobile which summarised the various technologies developed in W3C which increase the capabilities of Web applications and how they apply to use on mobile devices. The document describes a variety of features which will enhance use of mobile devices to access Web products which are grouped into the following categories: graphics, multimedia, device adaptation, forms, user interactions, data storage, personal information management, sensors and hardware integration, network, communication and discovery, packaging, payment, performance and optimization and privacy and security.